The first thing that attracts the eye is this cover – the Jimi Hendrix posture. Noah Howard, one of the great underestimated figures in free jazz, in concentrated rapture. It’s an iconic picture of him which was also used for his 1979 recording “Ole”, on which he presents a fabulous version of the Coltrane composition. All of Howard’s commitment, his ability to listen, his grandeur is expressed in this picture. Yet, for mysterious reasons Howard (1943 – 2010) has never received the same attention as – let’s say – Archie Shepp, Joe McPhee or Albert Ayler (by whom he was deeply influenced) although he recorded two great albums on ESP (“Noah Howard Quartet” and “At Judson Hall”, both released in 1966) and even one on a major label, the fantastic “The Black Ark” (Polydor, 1972) and my two favorites, “Berlin Concert” and “Schizophrenic Blues” (both on FMP/SAJ), which he recorded after he had moved to Europe. It was in April 1974 when he recorded “Live at the Swing Club Torino, Italy”. The session features Howard (alto sax, bells, tambourine) alongside Michael Smith (electric piano, acoustic piano), Bob Raid (bass) and Noel McGhie (drums). The album was out of print for a very long time and has now been re-released, which is a real moment of happiness for all free jazz fans. The reason is the wonderful music which is presented on this album. Howard is a true Coltrane disciple and you can hear that in every tone of his alto. From the very first note on the opening track Paris Dreams it is all there: the piano arpeggios, the driving drums and the pulsating bass and Howard’s soulful sound which is firmly rooted in blues and gospel. Howard gives his fellow musicians a lot of space to shine, especially Noel McGhie, who introduces the B-side of the album with a long drum solo before Howard and Michael Smith drop in with a forceful riff that reminds of Joe McPhee’s “Nation Time” phase. The highlight of the album is Lecke, a spiritual ballad that reminds of Coltrane’s Alabama with its deeply moving, irresistible melody and Bob Raid’s lamenting bowed bass. 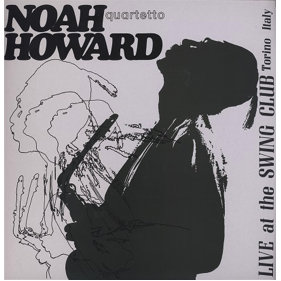 “Live At The Swing Club Torino, Italy” is a great album, especially for fans of classic free jazz of the late 1960s and early 70s period. It is available on 180 gram high quality vinyl only and limited to 300 copies. You better be quick.